Hine is my favourite photographer. Aside from being technically excellent, his black and white photographs are some of the most important ever taken. His record of the first half of the 20th century is a unique glimpse into the real lives of working-class America, and his work for the National Child Labor Committee (NCLC) was instrumental in bringing about change for the nation’s children. Hine’s work was not without risk. 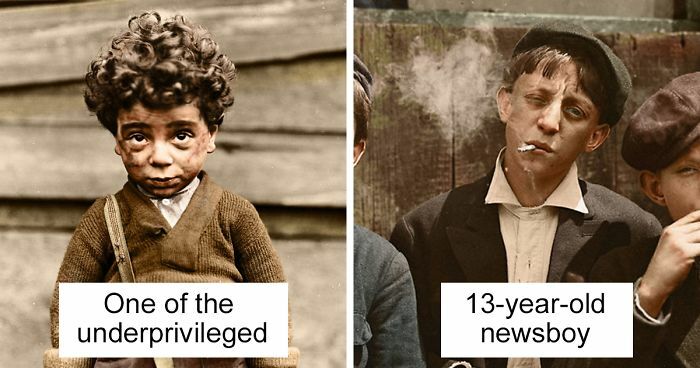 The immorality of child labour was hidden away from the wider public at the time, and his exposure to the underhand practices posed a threat to the industry. He was threatened with violence and death from factory foremen and would resort to wearing disguises such as a fire inspector or industrial photographer (making a record of factory machinery) in order to gain access to the workshops. As a photo colouriser, my aim is always to try and connect with the photo subjects on another level, something not always possible with a black and white photo. Hine’s photos are perfect for this purpose as they are already very engaging pieces. The eyes of the children are often the first thing we notice, and his photos are so crisp and focused that I believe the addition of colour really helps to bring them to life. As always in the digital age, it is easy to scroll past black and white photos without giving them a second glance, so I hope people will stop to look at these photos and learn more about the children pictured. 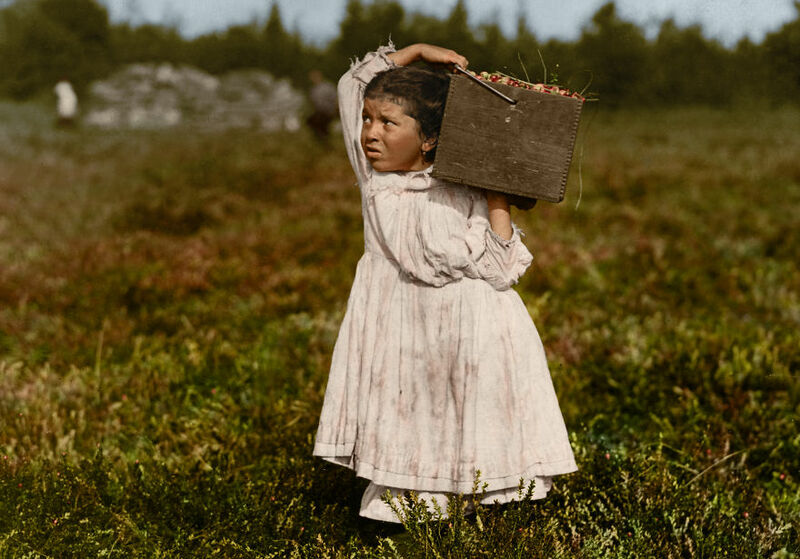 All original images © Lewis Wickes Hine courtesy of the US Library of Congress. 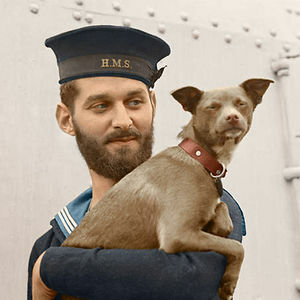 Colourised images © Tom Marshall (PhotograFix) 2018. Shucking is the process of removing shells from shellfish. 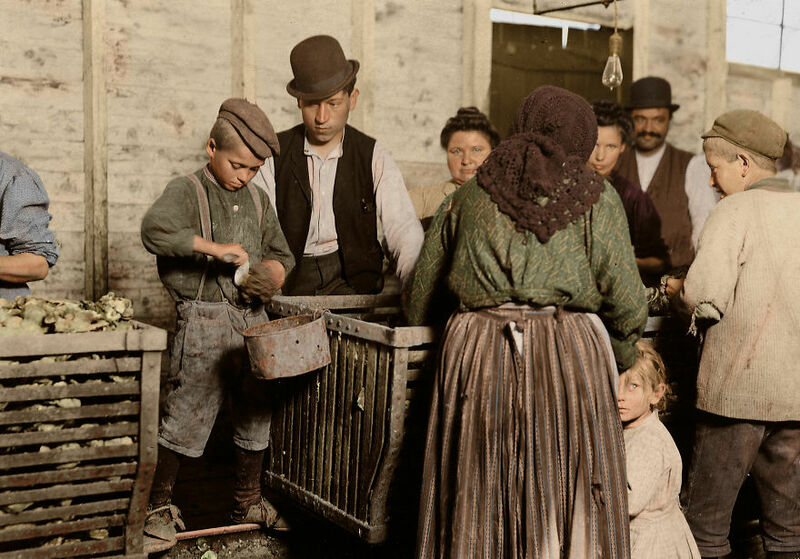 The original caption states that the shucking boss pictured was also a ‘padrone’, an employer who exploits immigrant workers. The caption continues that for four years he has brought these people from Baltimore. 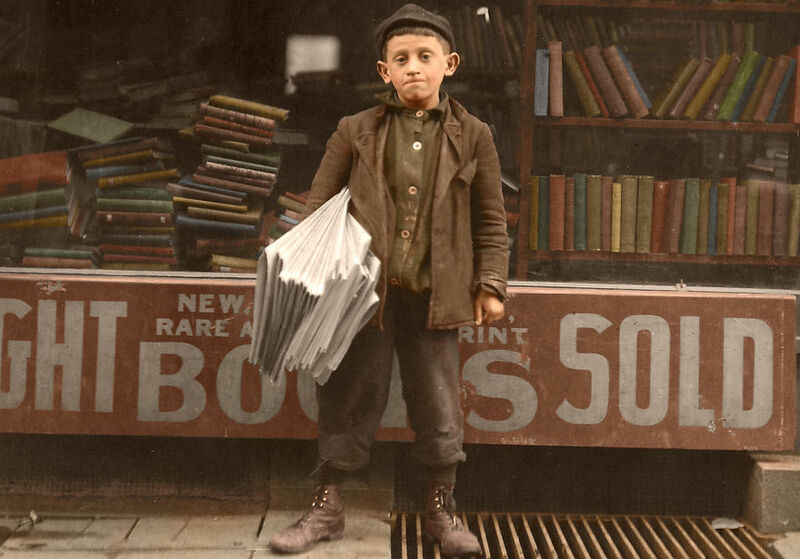 This boy had just recovered from his second attack of pneumonia and was found selling papers in a big rain storm. 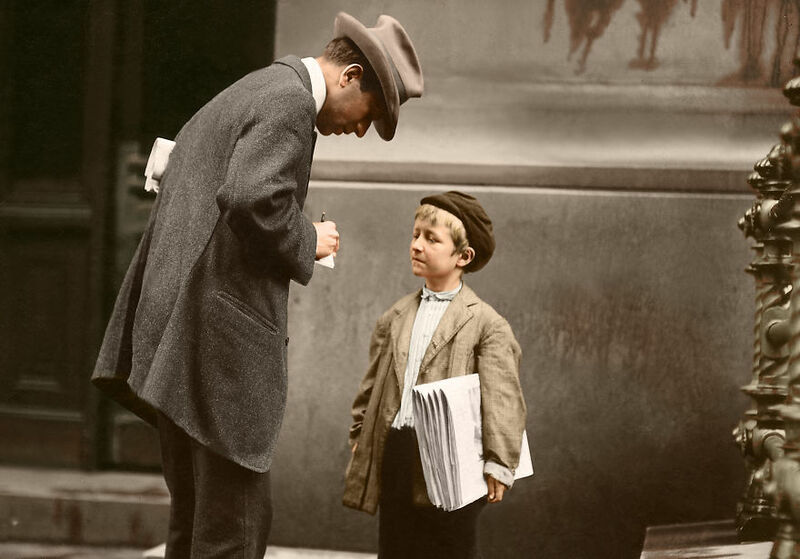 The photo was taken by Lewis Wickes Hine in Philadelphia, Pennsylvania in June 1910. The man taking the boy’s details is likely Hine’s assistant. I decided to include it to show a different view of childhood, hopefully depicting a better outcome and improved conditions for America’s children at the time. wow and that is historical, today it is just not so accepted but just as common. Not only in India... behind closed doors for sure- like the kids sewing. This hurts my Heart. I am not for pampering Kids until they are 44 but at age 5, 10, 12, etc. you should be just that... a child. The little curly-haired boy: An old man's face on a 5-year old.